Former Heavyweight Champion of The World! 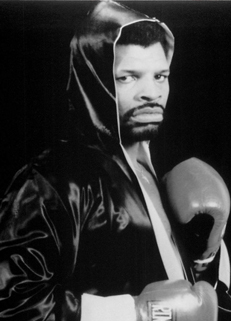 Leon Spinks is a former American boxer. He had an overall record of 26 wins, 17 losses and 3 draws as a professional, with 14 knockout wins, and was the former World Boxing Council and World Boxing Association heavyweight champion of the world. Spinks defeated 36-year-old Muhammad Ali for the undisputed heavyweight championship in what was regarded as one of the bigger upsets in boxing, but later was stripped of the WBC title for fighting Ali in a rematch in a fight which he lost via 15-round unanimous decision. In addition to being heavyweight champion and a gap-toothed grin (due to Spinks losing two and later all four of his front teeth), Spinks has become just as famous for the fall from grace he suffered after his career took a downward slide following his loss to Ali. He won the gold medal in the light heavyweight division during the 1976 Summer Olympics in Montreal, alongside brother Michael Spinks, who also won a gold medal in those games. Two years earlier, at the inaugural 1974 World Amateur Boxing Championships in Havana, Cuba, he captured the bronze medal. His Olympic teammates included Sugar Ray Leonard, Leo Randolph and Howard Davis Jr.